for Lynne and James Borne, Richard Jordayne, Edward Adams and Roger Rippington; Pembroke's house, 7 June 1573. After Henry VIII's death in 1547, Brook House, Hackney, was granted by Edward VI. to Sir William Herbert, Earl of Pembroke (July 10th 1547). Pembroke was one of the trustees of the will of Henry VIII. Henry Middlemore was the cousin of Sir Nicholas Throckmorton - Elizabeth's prime envoy to France. Therefore on 7 June 1573 Roger Rippington was being assigned deputy to the Special Ambassador to Elizabeth I and was working at Brook House, Hackney for Sir William Herbert, the 1st Earl of Pembroke. Sir William Herbert married Anne Parr; sister of Henry VIII's sixth wife, Catherine Parr. He was remembrancer of the exchequer ... the eldest son of John Fanshawe of Fanshawe Gate, Derbyshire, where he was born some time in the reign of Henry VIII, (probably about 1530). He studied at Jesus College, Cambridge, and became a member of the Middle Temple. Baptised 17 Aug 1546 St. Margaret's Church, Westminster. 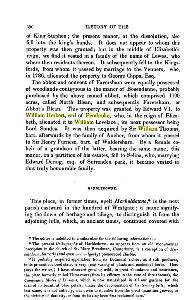 The Royal Abbey Faversham was also granted by Edward VI to Sir William Herbert - so this obviously explains why Roger left London sometime between 1573 & 1575, moving to Faversham in Kent - living at one of his employer's other houses.